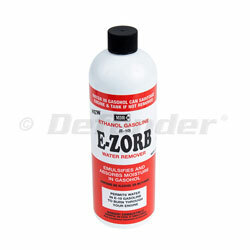 MDR Ethanol Gasoline E-Zorb Water Remover - 16 Oz. Following are some of the known facts about Ethanol when mixed into gasoline at the present designated ratio of 10% by volume (E-10). Ethanol attracts more water than plain gasoline. Ethanol contains only about 2/3 as much energy as plain gas, therefore getting poorer mileage (approx. 3%) for the same volume of gasoline. It only takes about 3/10 of 1 percent of water (.3%) to begin separating the water and 75+% of the Ethanol from the fuel, which then drops to the bottom of the tank with the water. There it forms what is known as a “single phase separation” layer of water and Ethanol under the gasoline. This small amount of water equates to slightly under 4 oz of water per 10 gals of gasoline. When the water/Ethanol layer at the bottom of the tank rises to the level of the fuel pickup, it will be sucked up into the engine, shutting the engine down. The water/Ethanol layer WILL NOT support combustion. MDR’s Water Probe Indicator (MDR-566) (Sold Separately)can determine if water is present at the bottom of a fuel tank, and in fact, how much water is there as long as the tank can be dipped straight down. If necessary, removing the fuel sender provides a typical access for this test. Ethanol (E-10) adds about 2 points of octane to the gasoline when totally in solution, but then loses that octane when the Ethanol drops to the bottom of the tank with water. E-10 evaporates more quickly than plain gasoline, thereby losing some of the added octane in the process. E-10 will deteriorate fiberglass fuel tanks (pre-1985), allowing the residue to eventually clog up fuel systems and intake valves enough to seriously damage engines. At the same time, the octane lost when the Ethanol went to the bottom of the tank with the water will also be replaced back into the fuel.